2nd Light Forums Forums - Trump and a Democratic witch hunt? FORUMS National Enquirer (FORMERLY NSR) Trump and a Democratic witch hunt? 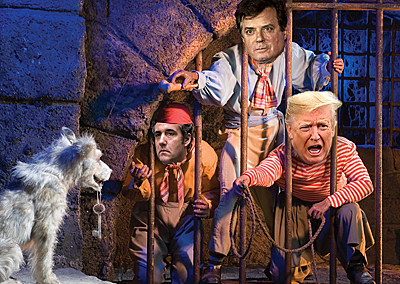 Topic Title: Trump and a Democratic witch hunt? Topic Summary: Not so much. But Trump is wrong to say what he's experiencing is unprecedented. Presidential investigations by Congress have been led by both Democrats and Republicans and are actually the norm when the House is controlled by a different party than the president's. There is a BIG difference between running some investigation and literally STOPPING the President from being able to do his job! He can cry all he wants. Nope....better find out how many hours in a day there are and how many Trump has to use to respond to your party's investigations! Trump has yet to be subpoenaed and hasn't responded to much at all. Like I said, it's a lie. If you cut Trump's tv feed, he would be truly pissed. Twitter keeps him at a 41% approval rating. I say keep the Twitter. His twitter might be the strongest evidence against his ignorant lack of intent argument. That's going to be fun. That will be a fast drinking game. Every time trump says that is what I said but not what I meant. I love all of the predictions and tin foil hat conspiracies that yall' concoct. FORUMS : National Enquirer (FORMERLY NSR) : Trump and a Democratic witch hunt?